On Monday evening I went to see Gilbert & George in conversation with curator and writer, Marco Livingstone at the White Cube. It was for the re-launch of their 1971 publication, Side By Side and I was filled with admiration for their love of books and printing but also for their incredible powers of self-promotion. As a marketeer, with a particular focus on digital marketing, it was fascinating to hear about how they promoted themselves before technology; spreading the word about their work through their postal art works, publicising where they would be eating every night and putting all their details in the telephone directory (although they claim no-one has ever contacted them). At the end of their talk I got an opportunity to ask them about their thoughts on social media, but they informed me that they were totally anti-technology: “We walk past people on their mobile phones and all they are talking about is what they are going to have for dinner.” Then it makes sense, to Gilbert & George, technology, mobile phones, social media: all of these things are so momentary, ephemeral and at odds with the printed material, with real books. It was incredible to hear them talk; passion and humour. Living sculptures. Living legends. Here’s an article I wrote for CAN on their passion for the printed book. On Monday 10th December Gilbert & George launched an edition and re-print of the now incredibly rare ‘contemporary sculpture novel’, Side By Side, at White Cube, Bermondsey. Gilbert & George were in conversation with writer and curator, Marco Livingstone talking above all about their passion for books and printed materials. Each of the 2000 copies of Side By Side are bound in a hand-marbled, unique linen cloth cover. With perhaps more than a hundred copies laid out on a table draped in black cloth at the White Cube the psychological seductiveness of the edition becomes clear. I find myself in a turmoil of indecisiveness; which cover will I choose? Do I want gilt letters on the binding or black embossed letters? But this is really the most minor of details when compared with the choice between marbled covers: a red Mars-dust swirl? or an earthy pattern of mustard-highlighted land-masses? or a pale, delicate wash of charcoal greys and rain marks? Each have an inexplicably diverse appeal. I see people leaving the table with four copies in their arms and yet somebody suggests that there is really no difficulty in the decision at all – people are drawn to one single book. Gilbert & George talk about the collaborative process of marbling the linen, the two artists switching between choosing colours, dropping them in the liquid and dipping the linen to be marbled. George explains that in some ways this is an automatic process and yet each cover also represents something of what they were thinking and feeling at the time. Your choice, he confirms, says something about your personality. What Gilbert & George present is something of a polemic on the book as object. Side By Side’s new marbled covers take inspiration from the marbled end papers of old bindings; the designs are looser, unstructured when compared with the precision of existing designs and bindings, a random product of moments of thinking and feeling. But there is a homage within them nevertheless which expresses a bibliophilic passion. 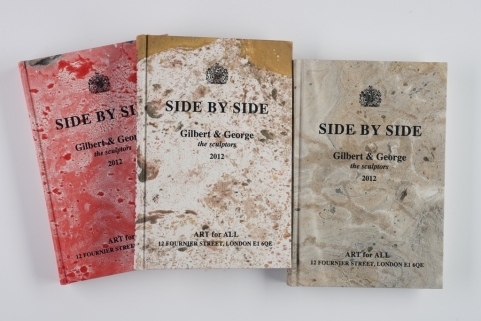 In 1971 Side By Side was published in an edition of 600 by the Koenig Brothers but it quickly became a rare and valuable item and Gilbert & George were disappointed to discover that copies were not to be found in art libraries and public collections, they had slipped out of common reach. This re-printing is a testament to their belief in books as ‘democratic’ objects, “you can buy them, borrow them and lend them”, explains George. They have always designed and published their own books, hefty tomes of the complete pictures, but Side By Side was their first publication. They recall sitting in the Wimpy Bar at London Liverpool Street station with their photographic plates propped up at the end of the table as they composed the texts for their pages. Something of that life is re-printed here, 70s Wimpy bars and a lingering vision of east London as experienced by two young artists, in this ‘facsimile’ edition. And yet, the 2012 edition is also something entirely new, packaged in those tempting and disorienting marbled linen covers. This Side By Side is a very contemporary and poetic ode to the book as object. Watching all these people poring over covers and leafing through pages I wonder why more people aren’t making books like Gilbert & George, books to fall in love with for their touch, their feel, their absolute aesthetic luxury. This is an article written for the December issue of the Hackney Citizen. This month Stephanie Wehowski’s white tower of mushrooms, Stupa, marks the end of the WW Gallery’s year-long showcase and experiment with public art, the Patio Projects. Last year the projects began with Eva Lis’ Mudman just as the London Riots were breaking out across the park and in the neighbouring estate. But the overriding message has been of the strength of locality, connections and conversations. PP13: Stupa is simultaneously supernatural and organic; the perfect dichotomy for a summation of the Patio Projects, which have offered residents extremes of both the hauntingly familiar and the strikingly bizarre. This dichotomy, whether the echo of the local birds flitting about Hackney Downs Park (the duplicitous magpies in Kate Davis and David Moore’s Pica Pica and the many hundreds of mummified pigeons in Delores De Sade’s The Form of a Thing is the Outcome of all it Endures) or such delights as the gruesome saccharine display of Flora Parrott’s sugar fingers and Lucy May’s kitsch wax kebab: has certainly been a talking point. Some of the neighbours have got involved in the projects throughout; Otto the ginger cat has continued to spread his mischief, unravelling Evy Jokhova’s Stringscape and spreading his plastered paw-prints out onto the street from Hanae Utamura’s CONSTRUCT. The Patio Projects have represented a localised social history and have been a frequently surreal documentation of a Hackney neighbourhood. The Three Sisters pub at the end of the road has hosted the overspill from all of the cold and wet PVs, and has offered an equal refuge for artists enduring the weather as they install. The Projects have been best when they do more than just let the neighbours in, when they have reflected and absorbed the very atmosphere of the locality. Kirsty Tinkler’s Face/Off and Jokhova’s Stringscape were both inspired by the rich architectural legacy of the East End of London, and were different kinds of patchworks of the urban landscape facing and surrounding them. These public art works came to belong to the place, to the street, and so it’s fitting that at the end of the month they were taken apart and destroyed. Directors of WW, Debra Wilson and Chiara Williams sometimes found it difficult to convince residents to attend Private Views when the gallery was tucked away inside the flat, but bringing the art out onto the street has made it a little harder to avoid. Every First Thursday over the year of the projects, a crowd has gathered on the street beside the patio, come rain or shine. This crowd has been just as likely to include disinterested residents as artists and gallerists. The projects have each spoken to different people in different ways: Jokhova remembers the electricians who mistook her Stringscape for the telephone exchange, and Andy Wicks recalls that estranged from the banks of the Thames, Beached was transformed by imaginations from a mooring structure into a giant easel. That’s the beauty of public art; there is no hand-out to dictate the deeper meaning, no gallery assistant to correct your assumptions. You can stop on the street to consider it for as long as you like, or judge it as you pass out of the corner of your eye. PICA PICA by ME/WE productions (Kate Davis & David Moore) will become a permanent addition to the patio and ‘gift’ to the street, jointly donated by the artists and the gallery. A publication about the Patio Projects will also soon be published as a part of its legacy.